WeChat Official Accounts can be understood as the WeChat equivalent of a Facebook page. They are drawing a lot of interest these days, as WeChat has risen to dominate the Chinese social media space (Chinese users spend ⅓ of their smartphone time on WeChat). To promote the CompMusic research outcome, I made a series of interviews with the students who were or are currently working on jingju music computational research. They are two former PhD from Centre for Digital Music, Queen Mary University, London and the Masters and PhD students from MTG-UPF. These interviews plus a summary were then published in a Wechat Official Account (声学挖掘机). CompMusic has finished, and our funding agency, ERC, asked us to write a brief report. Here is it. The CompMusic project has been a big and long project with many achievements, impossible to summarize here. For a presentation of all the results please check the project website. Here we try to just highlight the main achievements. Saṅgītarasikā, with the support of CompMusic organized a concert titled "Nīla Saṅgīta": An evening of Indian Classical Music and Dance, at Arts Santa Mònica, La Rambla 7, Barcelona on the 25th June, 2015. The ensemble included Núria Cabo (Kathak dance), Amit Mishra (tabla), Jordi Prats (sarod) and Jacopo Pacifico (bansuri). The ensemble opened the show with the instrumental performances of the bansuri and the sarod, both accompanied by the tabla. The Kathak recital, in which the dancer performed the sacred love stories of Radha and Krishna, brought all the artists together on stage. 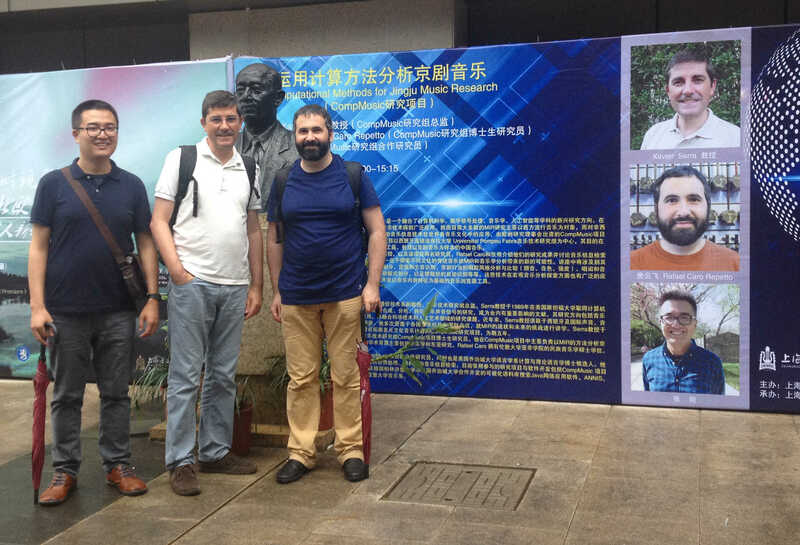 Last May, Xavier Serra, Zhang Shuo and Rafael Caro spent more than two weeks in China visiting different companies and universities with the aim of sharing our research on jingju music and the hope of finding possible collaborators for CompMusic. From May 15th to May 28th we visited five universities, three music conservatories, three companies, one theatre academy and one research centre, giving fifteen talks both in Chinese and English to audiences ranging from computer engineers to musicologists, musicians and music aficionados (you can find here an abstract of the presentation, the slides and related videos). In each of these venues we received a warm welcoming and interest from the audience. Shuo, Xavier and Rafael in front of the Shanghai Conservatory of Music. 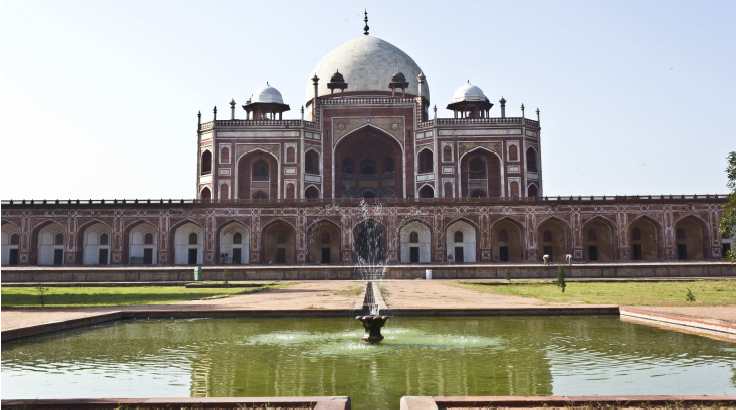 Dhrupad is an ancient vocal genre of Indian Art music. 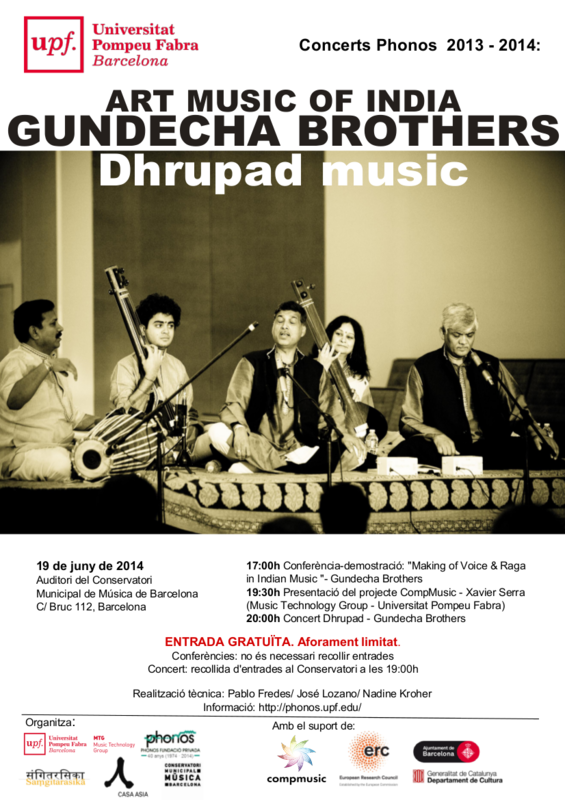 Gundecha Brothers, who are among the most active exponents of Dhrupad music, visited Barcelona for a lecture demonstration and a concert. They also visited the MTG before the concert for a discussion with the CompMusic team. They were very supportive of the activities of CompMusic and gave us valuable suggestions. The lecture demonstration and the concert were held at the Conservatori Municipal de Música de Barcelona. The lecture demonstration was tiltled "Making of Voice and Raga in Indian music" and aimed to explain several concepts of Dhrupad. It provide valuable insights into aspects of voice, melody and rhythm in Dhrupad. Prof. Xavier Serra presented an introduction to CompMusic project. The concert was very well received by an audience of over 400. The event was organized by CompMusic, Phonos, Casa Asia, Samgitarasika and Conservatori Municipal de Música de Barcelona with support from several organizations. 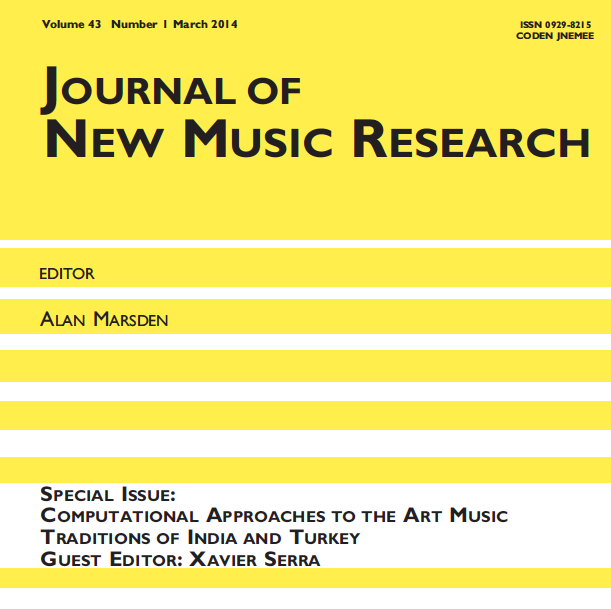 The current issue of the Journal of New Music Research (number 1 of volume 43, published on March 2014) is fully dedicated to research done in the context of CompMusic. This is a very important contribution of our project. CompMusic has reached the midpoint and our funding agency, ERC, asked us to write a brief report on our progress. Here it is. 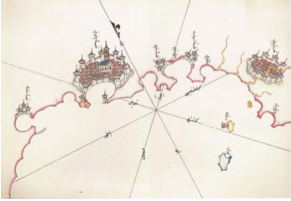 In CompMusic we want to advance in the field of Music Information Research by approaching a number of current research challenges from a culture specific perspective. We want to develop information modelling techniques of relevance to several non-Western music cultures and in the process we want to contribute to the overall field of MIR. The work carried out during the first half of the project, from July 2011 until now, can be grouped under six headings: (1) choosing the music repertoires and building the research team, (2) identifying and defining the research problems and methodologies, (3) building the research and test corpora, (4) characterizing melody and rhythm, (5) developing an overall evaluation strategy, and (6) disseminating the project goals and results. On December 13th, 14th and 15th, we organized the 3rd CompMusic workshop together with several other events at IIT-Madras (Chennai, India), all of them related to the work we are doing on Carnatic and Hindustani music. On the 13th we organized a research workshop to present current research results, on the 14th we organized a special seminar aimed to the general public and dedicated to the tools we are developing for the exploration and appreciation of Carnatic music, and on December 15th there was a lecture demonstration by the mridangam virtuoso Dr. Umayalpuram K Sivaraman. The slides and video recordings of most of the presentations are available online. In CompMusic we have pooled in a lot of resourceful information about music from different parts of the world, from a variety of sources: metadata (eg: Musicbrainz), structured data on the web about different entities (eg: DBPedia pages for artists/raagas), audio analysis (eg: melodic/rhythmic descriptions) and data mining (eg: forum/social data analysis, textbooks). Dunya , being developed in the project, is a web-based software application to navigate the music collections using descriptions of concepts specific to the given music. Specifically in this context, even though each of the information sources is useful and important in its own way, interlinking them yields certain advantages. Some of these are mentioned as we progress through the blog post. 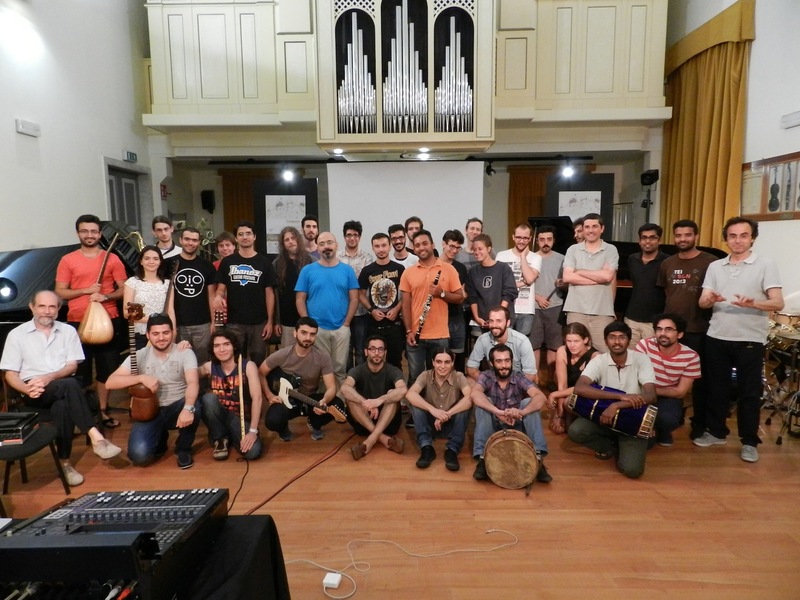 From the 15th to the 26th of July 2013, some members of the MTG participated to the Galata Electroacoustic Orchestra Intensive Program (GEO-IP). 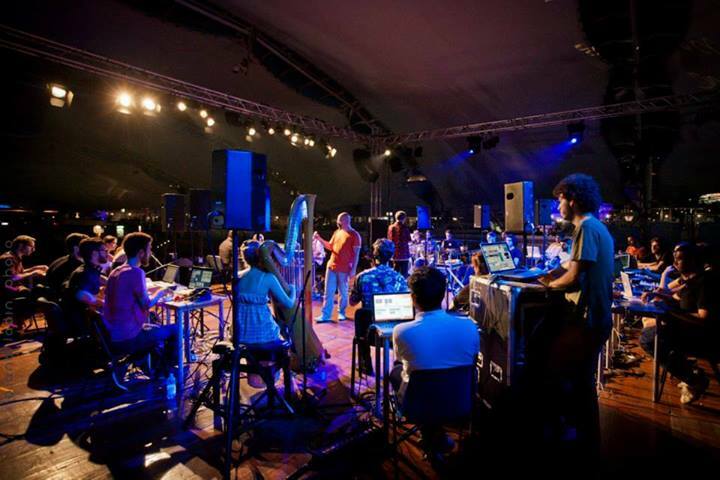 GEO-IP is a summer school under the Erasmus Lifelong Learning Programme whose aim is to fuse the traditional music of Istanbul, Genoa and Barcelona with contemporary electronic music. 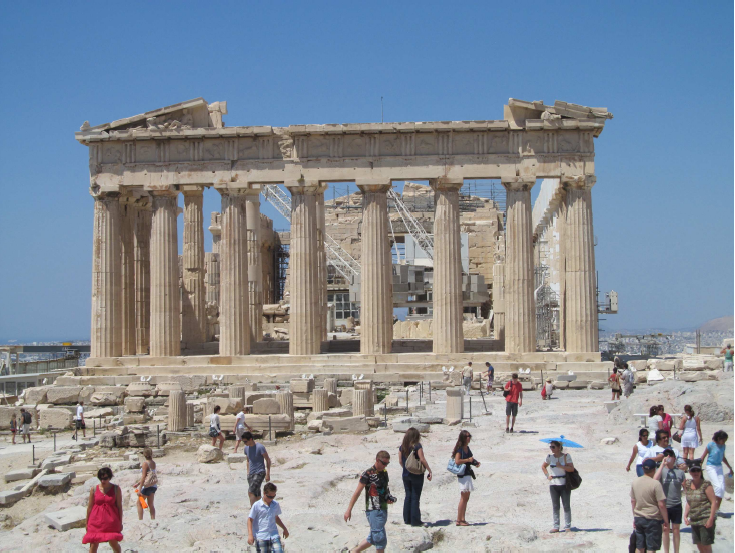 These three Mediterranean harbor-cities have been in commercial and cultural exchange for centuries, and share numerous historical, sociological, cultural and architectural connections. An example is the Galata Tower in Istanbul, which also gives its name to the orchestra. 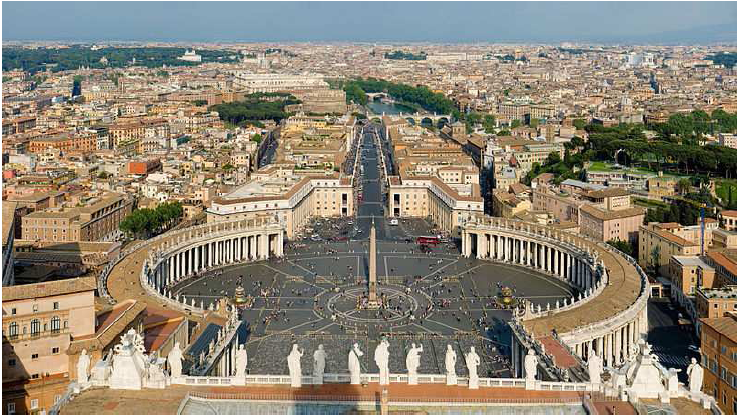 This landmark was built by the Genoese in the 14th century. Kaustuv Kanti Ganguli from IIT Bombay (India) and Vignesh Ishwar from IIT Madras (India) visited MTG for a research stay and as a part of their visit, two concerts were organized jointly by CompMusic and Phonos. Spread over two days, the Carnatic and Hindustani music concerts were preceded by a lecture demonstration (lec-dem) to help the audience understand and appreciate the music better. The concerts and lectures were held at Arts Santa Mònica, Barcelona. Both the concerts were well received by the audience, with packed halls. We have multitrack recordings of both the concerts which would be very useful for research and analysis. 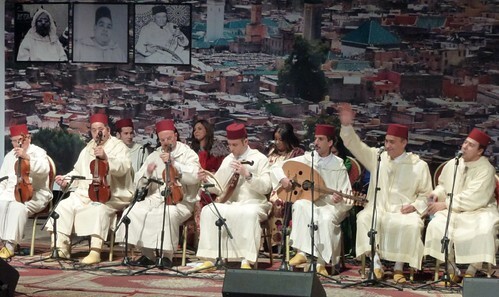 On February 2013 I made a trip to Morocco, together with Mohamed Sordo, to attend an Andalusian music festival in Fez and to meet with the musician and musicologist Amin Chaachoo in Tetouan. This was the first trip to Morocco in the context of CompMusic and the objective was to stablish contacts and to decide the first steps to take in our research on Andalusian music, which is one of the five music cultures that we want to focus on. M.V.N Murthy, collaborator of CompMusic that a part from being a physicist is an excellent Veena player, wrote this very nice article about the aesthetics of Indian art compared with the European one, specially talking about music. On the weekend of November 10th-11th, the CompMusic team hosted the annual MusicBrainz summit (in its 9th edition) at the Universitat Pompeu Fabra, Barcelona. The yearly summit is an opportunity for the geographically diverse MusicBrainz community to meet for a few days and do high-level planning for the next year of site development. As most communication in the MusicBrainz world is performed over email and internet chat, it is useful to get together face-to-face to quickly come to an agreement on topics that otherwise may take a long time to discuss online. The 13th International Society for Music Information Retrieval Conference (ISMIR 2012) was an important event for CompMusic. At ISMIR 2011 we had presented the project and some very preliminary work (see blog post) and this time the goal was to have a stronger impact by presenting more mature research results. We definitely succeeded, we had 8 papers from CompMusic (see news item) and other papers and events showed the influence of our project. In publications, it is many times necessary to include Indic terms that cannot, or should not, be translated. Hence, we use the terms transliterated to latin script. In most scientific papers and other publications we find those terms transliterated very liberally. This results in two problems: (i) Ambiguity in their pronunciation (Eg: whether to elongate a vowel or not), (ii) Multiple spellings for a given word (Eg: Sourashtram, Saurastram). This is the reason why good publishing houses use a transliteration standard which enforces consistency and improves readability. ISO 15919 is one such widely used standard which defines a transliteration/romanization scheme for all the Indic scripts/languages. It is a super-set of IAST which is defined for Sanskrit. 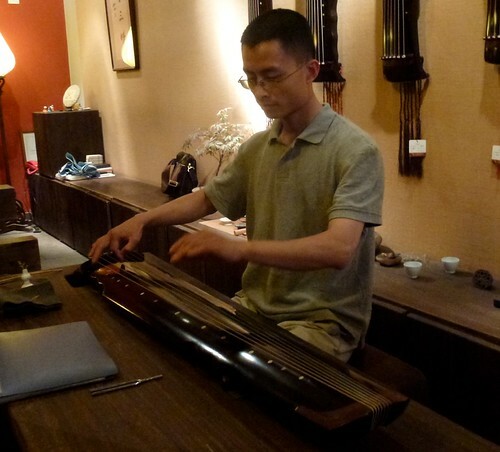 During the month of May 2012 I was in China, mainly in Beijing, making contacts for CompMusic and trying to learn about the art music of China. I knew very little of the traditional Chinese instruments and even less about the different music traditions that exist in China. This trip opened me a fascinating world that I would like to study further and understand more. Here I just write a bit about some of the instruments that I was able to get in contact with and about some aspects of their music. I briefly write about the Guqin, Xun, Pipa, Guzheng, Sheng, Erhu, Dizi, Xiao, and also about the modern Chinese orchestra and the Beijing opera. On July 12th and 13th 2012 we organized the 2nd CompMusic Workshop in Istanbul, at Bahçeşehir Üniversitesi. Right before the workshop we also had three days of meetings with all the project team. This was the first time we had all the members of CompMusic together. The location was idilic, right on the Bosphorus, with a great view of the strait and of the city. Both the pre-workshop meetings and the actual workshop were very successful, academically and socially. Thanks to the great organization by the team of Bariş Bozkurt everything went very smoothly and the feed back by the participants has been very positive.